The New Testament records that once a person believes in Christ, they start the journey of discipleship: following Jesus, to learn from Jesus, to become like Jesus. This journey of discipleship is a process, an adventurous process of becoming like Christ and helping others become like Christ. It is a work of the Holy Spirit and we can’t do it without him. But he won’t do it without us; we must cooperate. This adventure of becoming like Christ is mysterious, but not haphazard. By watching Jesus in the Gospels, a clear pattern emerges that he used for discipling. It’s an adventure that involved many steps through a variety of experiences and settings over a period of three years. 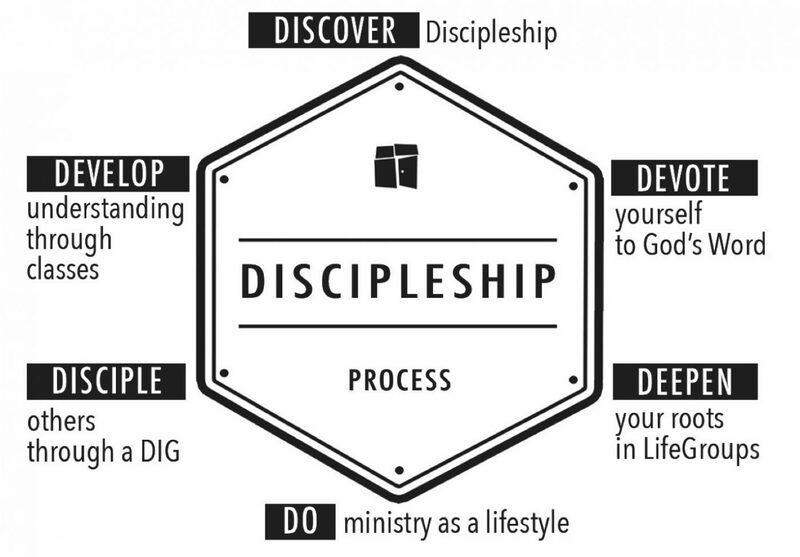 We have developed our Discipleship Process based on Jesus’ pattern. Jesus discipled as he spoke to the crowds, as he met with the Twelve, as he taught in synagogues and homes, and as he pulled aside Peter, James and John for more intensive training. As we study Jesus’ discipleship method, we can see him utilizing six different components in multiple settings to accomplish his purpose. The night before Jesus died, he was able to say to the Father, “I have finished the work you gave me to do” (John 17:4). Since he hadn’t yet died on the cross for our sins, what was “the work” he had “finished”? Perhaps it was to train the disciples God gave him. We can follow Jesus’ pattern today as we become disciples who make disciples. Jesus promises to be with us (Matthew 28:20) by the presence of the Holy Spirit as we do this. The Holy Spirit is actively working to make us more like Christ and He will lead us through all of these components along the way. Sometimes the following six components are sequential, sometimes not, but they are all necessary in the process of discipleship. The first component is Discovering Discipleship. Jesus spoke to the masses and to individuals, teaching them about the Kingdom of God and inviting them into a life of discipleship (Matthew 4:17-25). Jesus was calling people out of self-centered living and religious rituals and inviting them into a way of life that involved following him and growing as his disciple. So today, people discover discipleship either as they receive biblical teaching on discipleship, or when they come into contact with true disciples in or out of church. Think about it, everything Jesus said was “the Word of God” and the disciples heard it taught in the crowds and heard it every day as they spent time with him. Without realizing it, they were being soaked in and saturated by the Word of God. Devote yourself to the Word of God. Two of the greatest ways to devote yourself to the Word of God today are to commit to a practice of daily devotions and weekly worship. By being in the Word daily and sitting under the teaching of the Word on a weekly basis, the Holy Spirit will use the Word of God to shape our lives. Because the one constant we see in the transformation of people’s lives is the Word of God, we encourage you to devote yourself to the Word of God by hearing it, reading it, studying it, meditating on it, discussing it, memorizing it, applying it, and living it out. As will be explained later, the Disciple Journal is a tremendous tool to help facilitate that devotion, helping people develop the daily practice of Connecting to God through the Word and Prayer and listening for the Holy Spirit in the Word. Deepen your roots in LifeGroups. Jesus’ teaching amazed the crowds, but he knew discipleship couldn’t be accomplished on preaching and teaching alone. He taught the masses about some of the aspects of discipleship, but he called 12 disciples out of the crowd into a more focused group where they were able to deepen their roots while they discussed and applied what he taught the crowds (Mark 3:7-18). They asked questions, he explained his teaching, and they built community as they spent regular time together. Community is essential because no one becomes like Christ by themselves. We need each other. Discussing and applying the teaching keeps us from just hearing the Word, but not doing it. This is why we encourage people to be a part of a LifeGroup where the teaching from Sunday is discussed and applied and deep-rooted relationships are able to be formed. The Holy Spirit works in unique ways in community that don’t happen when we are just by ourselves. Do ministry as a lifestyle. It surprises many people how soon Jesus sent the disciples out to do ministry (Matthew 9:36-10:5ff). They watched him, he modeled, explained, and apprenticed them how to do ministry and then he sent them out to do what he did. Since the word “disciple” means “student” it is easy for some to think of learning as only learning information. But Jesus was not only teaching information, he was teaching a way of life and the skills to live that life. Disciples today often think that they have to have years and years of teaching and training before they can start doing simple acts of ministry. Jesus’ example of sending the disciples out to do ministry early in their relationship with him should correct that erroneous thinking. So today, we want to challenge people to start serving, start doing ministry early in their discipleship process. This could be serving their neighbor, praying for people, feeding the hungry, and many other lifestyle ministry actions. Learn to listen to the Holy Spirit and become a Spirit-led servant. He will lead you to ministry opportunities all around you. Doing ministry as a lifestyle also includes finding a regular place to serve in the body of Christ, which includes the process of finding your SHAPE and Servant Profile and connecting it to a serving role in the life of the church. Disciples of Jesus don’t do ministry occasionally, it’s a lifestyle. Disciple others through a Discipleship Intensive Group (DIG). Jesus didn’t call us to just be disciples, he called us to make disciples. Because we repeatedly see Jesus pull aside Peter, James and John (Mark 5:37, 9:2, 13:3, 14:33, etc. ), and because these three men are featured in the Book of Acts, many people have noticed that Peter, James and John grew faster and seemed to grasp more fully the lessons of discipleship Jesus was teaching. While he met with many people in one-time individual meetings, there is no record of Jesus ever discipling someone one-on-one. He did it in groups or 3 or 4 or 12. This fact doesn’t prohibit one-on-one discipleship, but it does commend to us Jesus’ method. Discipleship Intensive Groups of 3-4 people are encouraged to use the Disciple Journal and to meet weekly to share with each other what they are learning in their daily devotional times and work through a series of studies that form the foundations of discipleship. Most Christians today have not been discipled and the DIG provides the perfect platform to either be discipled or to disciple others. Whether it is one person discipling 3 others or whether it is 3 or 4 gathered to mutually help each other grow, Discipleship Intensive Groups are a core discipling mechanism. Develop your understanding through Classes. Most people find that the more they read the Bible, spend time in a LifeGroup, do ministry and disciple others, the more they become aware of how much they don’t know! As a person is growing in discipleship there should be a natural desire to get more training and learning, to go deeper, to develop greater understanding. This need is met through classes that specialize in a subject matter and range all the way from learning how to share your faith to advanced Bible study methods to theology classes of all kinds. Everyone is encouraged to start with Loving God 101, Loving People 101 and Living Surrendered 101 and then branch out from there to whatever area they choose. Should a disciple always be involved in every part of the process?